Case study: Who’s making the barrel bombs? Case study: Did Sepah Qods play a role in the Ghouta chemical massacre? In addition to footing the bill for Russian weapons, Iran has also been supplying the Syrian regime with Iranian weapons, ranging from rockets and missiles, rocket-propelled grenades and mortars, to drones and other military surveillance technology. Two Iranian arms shipments bound for Syria were intercepted by Turkey in early 2011. In May 2012, Reuters published an exclusive about a “confidential report”, seen by the news agency, submitted by a panel of sanctions-monitoring experts to the UN Security Council.296 The report dealt with three illegal shipments of Iranian weapons over the previous year in violation of international sanctions against Iran. Two of these cases involved Syria, it said, “as were the majority of cases inspected by the Panel during its previous mandate.” The third shipment involved rockets headed for Taliban fighters in Afghanistan. The following month, the panel of experts published its report, providing details of two interception by the Turkish authorities of Iranian arms shipments bound for Syria.297 The first was in February 2011, a month before the outbreak of the Syrian revolution, when the Turkish authorities seized a truck carrying Iranian explosives. The contents of the truck were clearly described on the shipping documents: two boxes of gunpowder M9, two boxes of propelling charge, two boxes of slow-burning material, one box of detonators, six pallets of solid rocket fuel and two pallets of RDX explosives. The two companies named on the shipping documents, Parchin Chemical Industries and 7th of Tir Industries, are subordinates of the Iranian Defence Industries Organisation. Both had already been designated by UN sanctions. The contract referenced in the invoice had been concluded in 2006 for a series of 20 shipments.298 For some reason, Turkey did not report this interception to the UN until January 2012. Since both incidents predated the Syrian revolution, it is not easy to link them directly to the Syrian regime’s brutal crackdown on the mass protests in Syria. Indeed, the shipments may well have been destined to Hezbollah Lebanon, Hamas or any other Iranian-backed militia via Syria.306 In January 2012, however, France’s foreign ministry “condemned” Iran’s “repeated violations” of the UN arms embargo by exporting weapons to Syria, citing the Panel of Experts’ report.307 Senior US officials also told AFP news agency that Iran was supplying munitions to “aid Syria’s bloody protest crackdown in an initiative spearheaded by the head of the Iranian Revolutionary Guards Corps’ elite Qods force, Qassem Soleimani.”308 The Iranian government denied the allegations, of course. The rest of this chapter will attempt to provide some evidence that the allegations were not unfounded. At this point, the Syrian revolution still largely revolved around mass peaceful protests that were being met by the regime with increasing brutality. It is likely therefore that Iranian military support to the Syrian regime – in addition to training and directing the regime forces and shabbiha, as detailed in previous sections – would have consisted mostly of crowd control weapons and surveillance equipment, which the Iranian regime used to crush the Green Movement protests in Iran in 2009. Iranian tear gas was allegedly used in Homs in July 2011. In June 2011, the European Union imposed sanctions against three top leaders of Sepah Pasdaran for their role in “providing equipment and support to help the Syria regime suppress protests in Syria.”313 The three were the force’s chief Mohammad Ali Jafari, the chief of Sepah Qods, Qassem Soleimani, and Sepah’s deputy commander for intelligence, Hossein Taeb. The US Treasury had listed Radan in September 2010 and Moqaddam in June 2011 for their “complicity in serious human rights abuses in Iran since the June 2009 disputed presidential election.”315 It had also already designated Sepah Qods and its senior commanders for providing support to the Syrian General Intelligence Directorate. As the revolution was gradually pushed towards militarisation and armed opposition groups started to achieve significant victories on the ground, the Iranian regime also stepped up its military support to the Assad regime to ensure its survival. 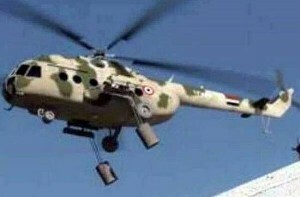 In March 2013, Reuters published another exclusive report, citing Western officials and diplomats, claiming that Iran had “significantly stepped up” its military support to the Syrian regime in the previous months, describing it as a “crucial lifeline” to Bashar al-Assad.320 As with sending Lebanese and Iraqi militias to Syria, the increased military support to the Syrian regime suggested the war in Syria had entered a new phase in which the Iranian regime played a leading role. But there was one problem: a viable route. The intelligence report specifically mentions two Boeing 747 aircraft as being involved in Syria arms transfers: an Iran Air plane with the tail number EP-ICD and Mahan Air’s EP-MNE. Both were indeed among 117 aircraft identified by the US Treasury Department in its sanctions designation in September 2012 as “blocked Iranian aircraft.”322 In addition to the airlines named above, the EU and the US also added to their Iran sanctions lists the names of Iranian shipping and construction companies associated with Sepah Pasdaran and apparently used for shipping weapons to Syria and a number of African countries. It is worth nothing that, in addition to targeting companies, the US Treasury also sanctioned Ismail Qani, the deputy commander of Sepah Qods, whom the department described as being responsible for “financial oversight” of the force’s arms shipments.325 Qani, as already mentioned, was the first senior Iranian official to admit a “physical” Iranian regime presence in Syria. Developments in Syria and Iraq in summer 2014 (the expansion of ISIS and the subsequent US air strikes against ISIS in Iraq) seem to have created a new obstacle for Iranian arms shipments to Syria via Iraq. 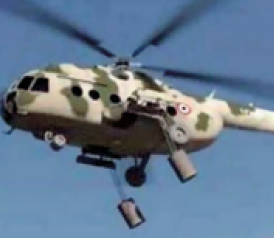 Various Syrian and Lebanese sources have told the authors of this report that Sepah Pasdaran commanders and weapons are now being flown to Beirut, where the airport’s security is controlled by Hezbollah, and then transferred by air or land into Syria. We have not been able to verify these claims or obtain any more details. One thing is for sure, though: the Iranian regime’s military support to the Syrian regime is becoming ever more risky and ever more costly. Judging by the intercepted shipments and the sanctions-monitoring reports, the kinds of weapons that the Iranian regime has been sending to Syria range from communications equipment and light arms (assault rifles, machine guns, explosives, detonators and mortar shells) to more advanced and strategic weapons such as shore-to-sea missiles, surface-to-surface ballistic missiles, and even unmanned aerial vehicles (UAVs). Iranian tanks (T-72 Ural TURMS-T, T-72M1 TURMS-T, T-72AV ‘T-82’ TURMS-T), multiple rocket launchers (333mm Falaq-2 and IRAM), ballistic missiles (Fateh-110 or M-600) and even military jeeps and vans (Morattab Pazhan and Sahra) are all known to be in the possession of Syrian armed forces and Iran-backed militias fighting in Syria.331 The question is whether these Iranian weapons have actually been used by Syrian regime forces and militias against civilians and rebels and whether there is undeniable evidence of that. This is important to establish the Iranian regime’s complicity in the war crimes and crimes against humanity committed by the Syrian regime and the militias fighting alongside it. Iranian rocket used in Damascus in May 2013. The video 334 shows an unexploded 107mm rocket, typically launched by Type-63 multiple rocket launchers. 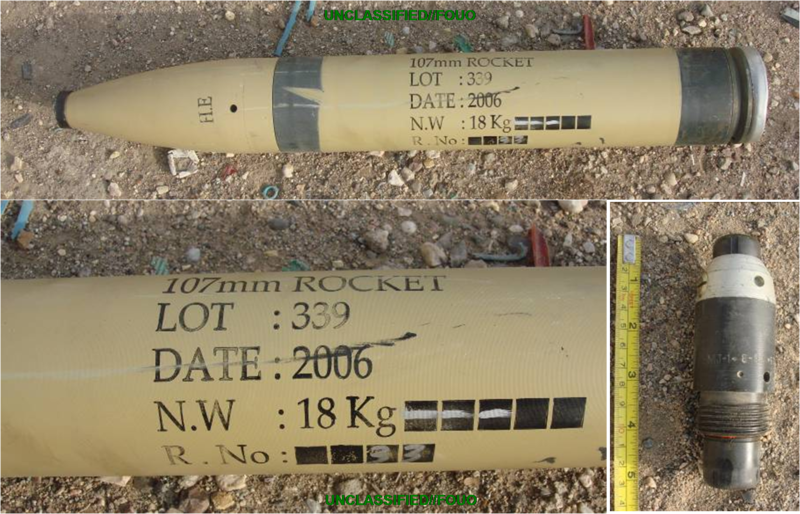 After examining various variations of the rocket, Higgins concludes that the colours and the markings on this rocket “strongly indicate it was manufactured in Iran.” Moreover, the date of manufacture, which can be clearly seen in screenshots taken from the video, is 2012. As he puts it, “it appears what we have here is an Iranian rocket manufactured in 2012, during the Syrian conflict, and the arms embargo, that has managed to find its way into Damascus.” The unexploded rocket was found amidst a completely destroyed residential area. The destruction was presumably caused by similar rockets that did explode. In another post a few days later,335 Brown Moses reposted another video 336 filmed by opposition fighters at a position they had just captured from Syrian regime forces. The video clearly shows the markings on a munitions box containing two 120mm mortar bombs, manufactured in 2012, with AZ111A2 fuzes. As Higgins points out, AZ111A2 fuzes are produced by the Iranian Defense Industries Organisation. 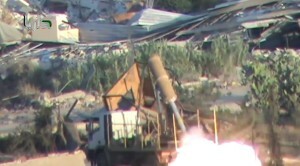 The box is seen among many others, and a rebel fighter is heard saying: “they were using this ammunition to shell civilians over there,” near the Tahmaz poultry farms in Hama. A member of the Abu al-Fadl al-Abbas Brigade posing with Iranian-made HS.50 rifle in Syria. Another Iranian weapon that has been used in Syria is the HS.50 anti-materiel sniper rifle, or rather, the unlicensed Iranian copy of it called Sayad-2.337 The Syrian armed forces were not known to possess these rifles before the start of the current war. Yet thousands of civilians have been killed in Syria over the past three years by snipers, many apparently using this Iranian rifle. 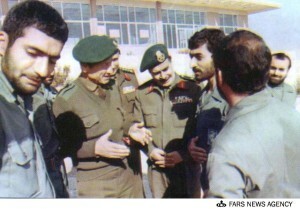 One of the first visits of Sepah Pasdaran nuclear missile experts to Syria (date unknown). Needless to say, it is not just the missiles themselves that the Iranian regime has been shipping to Syria but also the know-how. In August 2012, for example, Iranian media reported that 13 commanders from Sepah Pasdaran’s missiles unit went to Syria to train their Syrian counterparts.344 The team was reportedly headed by Hassan Moqaddam. The determination of the Iranian regime to do everything it can to support Bashar al-Assad’s regime is perhaps best exemplified by sending its latest unmanned aerial vehicles (UAVs or drones) to Syria. 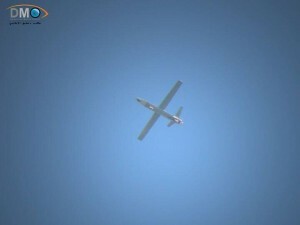 In April 2014, footage of the Shahed 129 UAV flying over Eastern Ghouta, Damascus, was posted on YouTube.345 The Shahed 129 was unveiled in Iran in late 2012 and entered mass production in September 2013 for the Aerospace Force of the Iranian army. 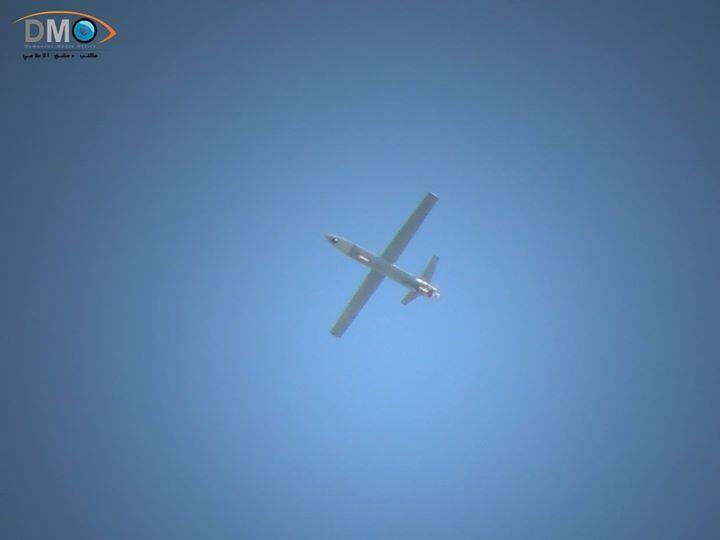 The Iranian drone Shahed 129 spotted flying over al-Ghouta near Damascus in April 2014. According to Oryx, the Shahed 129 flying over Ghouta is a modified version of the original Shahed 129, “possibly of the third batch manufactured.”346 The authors say improvements include a retractable landing gear and the ability to carry weapons (up to eight guided missiles). The drone seen in the video is not provided with missiles but this does not exclude the possibility that others are or will be. In November 2013, another new Iranian drone, known as The Yasir, was also spotted in Syria.347 The Yasir is apparently based on the American-made Scan Eagle, of which at least one has been captured by Iran. Iranian drones were first spotted in Syrian skies in early 2012.348 But sending its latest drones to Syria is a sign not only of the length to which the Iranian regime is prepared to go to defend Bashar al-Assad’s regime but also that it may be using Syria as a testing ground for its latest military technology. Iranian experts are allegedly involved in the manufacturing of Syrian barrel bombs at an arms factory near Aleppo. In July 2014, Syrian opposition media published what they claimed was an outline of one of the biggest and most controversial arms factories in Syria, near al-Sfeira in Aleppo, leaked by an engineer who worked there.350 The factory reportedly manufactures large quantities of barrel bombs, ground-to-ground missiles, mortars and other types of weapons commonly used by Syrian regime forces. Significantly, the engineer claimed that there are “four separate administrations competing with one another within the factory.” One of them is Iranian, he said, which is allegedly responsible for importing explosives and metals used to make shells, before sending them off to the “Chinese ovens.” The factory, according to the whistleblower, is overseen by the Syrian Air Force Intelligence, which submits regular reports to the Presidential Palace and coordinates with the Iranian and Chinese experts. If the engineer’s account of the Sfeira factory is true, then Iranian military experts and their commanders in Sepah Pasdaran may have been knowingly and willingly participating in one of the clearest and best documented types of war crimes committed in Syria, especially in Aleppo. 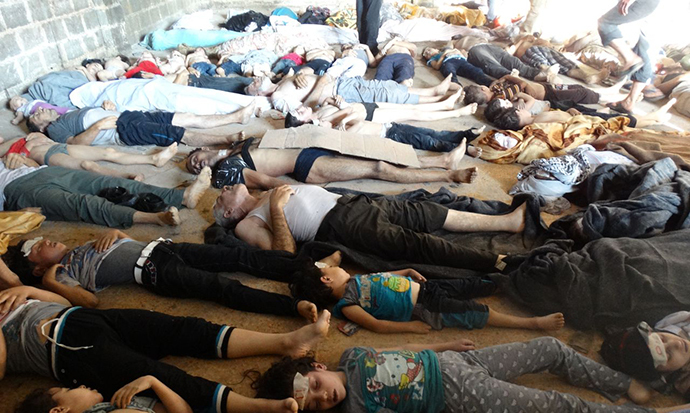 Victims of the Ghouta chemical attack on 21 August 2013. Apart from a few Syrian, Iranian and Russian propaganda outlets, and a few western journalists and commentators who fell for their propaganda,355 most serious observers around the world today agree that it was Syrian regime forces who committed the massacre, which the UN has described as a war crime. The evidence was divided into three parts. The first dealt with the question of whether the Iranian regime was aware of the plan to carry out the attack. After discussing various relevant pieces of evidence, the report concluded that it was highly unlikely that the Ghouta chemical attack was the result of Bashar al-Assad’s “losing his nerves,” as a German report had claimed. It was also unlikely, the report added, that the Iranian and Russian leaderships were unaware of such plans, as other media reports had suggested, citing other evidence that suggests the opposite. A thorough investigation by a specialist and independent team, Naame Shaam suggested, should be able to put together these and other pieces of evidence to establish whether Sepah Pasdaran had prior knowledge of the Ghouta attack and whether it had indeed advised and trained Syrian regime troops to use sarin and other chemical weapons. It should also not be very difficult for such a team to establish which Syrian military units carried out the attack (the 155th Missile Brigade, the 4th Armoured Division, etc.) and whether they had been liaising with Sepah Pasdaran ‘advisors’, as evidence suggests they have been. The second type of evidence is to do with whether Iranian weapons were used in the attack. 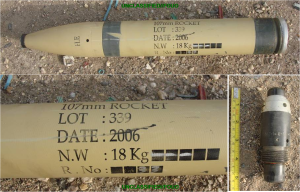 In addition to all the evidence detailed above of Iranian weapons being used in Syria, there have been a couple of reports specifically suggesting that the rockets used in the Ghouta attack may have been Iranian ones. Iranian Falaq-2 rockets may have been used in the Ghouta chemical attack. Finally, the Naame Shaam report raised a question about the possible role of Sepah-controlled Iraqi militias, particularly Kata’eb Sayyid al-Shuhadaa, that were present in the area during and in the immediate aftermath of the attack, according to some reports. Their task was reportedly to “guard” the besieged areas held by rebels to prevent people from fleeing. Clashes between the two sides were reported over the few following days and Sayyid al-Shuhadaa held funerals for a number of its fighters who were killed there. The area was also heavily bombarded by regime forces, perhaps to destroy evidence of the chemical attack, as a number of observers have suggested. The relevant question here is whether these Sepah-controlled militias’ presence in the area was pre-planned in connection to the chemical attack or was just part of wider military operations in the area. It should not be difficult for an international investigation to establish this. 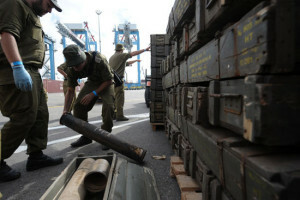 296 Louis Charbonneau, ‘Exclusive: Iran flouts U.N. sanctions, sends arms to Syria: panel’, Reuters, 17 May 2012. 297 UN Panel of Experts, Final report of the Panel of Experts established pursuant to resolution 1929 (2010), 12 June 2012. 300 US Treasury Department, ‘Treasury targets Iranian arms shipments’, 27 March 2012. 301 US Treasury Department, ‘Treasury sanctions major Iranian commercial entities’, 23 June 2011; US Treasury Department, ‘Treasury designates Iranian commercial airline linked to Iran’s support for terrorism’, 12 October 2011. 303 US Treasury Department, ‘Treasury designates Syrian entity, others involved in arms and communications procurement networks and identifies blocked Iranian aircraft’, 19 September 2012. 304 For more details, see: UN Security Council’s Iran Sanctions Committee, Implementation Assistance Notice: Conventional Arms and Related Materiel, (undated). 305 Louis Charbonneau, ‘U.N. publishes report on Iran arms trade with Syria’, Reuters, 29 June 2012. 306 Israeli air strikes on Syria have often claimed to be targeting such shipments. See, for example, Nicholas Blanford, ‘Israeli strike indicates Syria, Hezbollah may have crossed its ‘red line’ (+video)’, The Christian Science Monitor, 30 January 2013; Anne Barnard, ‘Syria blames Israel for fiery attack in Damascus’, New York Times, 5 May 2013. 307 ‘Statements made by the Ministry of Foreign [Affairs] and European Spokesperson’, France in the United States, 16 January 16 2012. 308 ‘Iran rejects French charge it is sending arms to Syria’, The Telegraph, 17 January 2012. 309 Adam Entous And Matthew Rosenberg, ‘U.S. Says Iran Helps Crackdown in Syria’, The Wall Street Journal, 14 April 2011. See also: Mark Hosenball, ‘Iran helping Assad to put down protests: officials’, Reuters, 23 March 2012. 310 Eric Schmitt and Robert f. Worth, ‘With arms for Yemen rebels, Iran seeks wider Mideast role’, The New York Times, 15 March 2012. 311 Hugh Macleod and Annasofie Flamand, ‘Iran’s support for Syrian regime raises questions of legality’, Global Post, 18 September 2012. 312 Mark Hosenball, ‘Iran helping Assad to put down protests: officials’, idem. 313 ‘Council Implementing Regulation (EU) No. 611/2011’, Official Journal of the European Union, 23 June 2011. 314 US Treasury Department, ‘Treasury sanctions Syrian, Iranian security forces for involvement in Syrian crackdown’, 29 June 2011. 316 US Treasury Department, ‘Treasury designates Iranian Ministry of Intelligence and Security for human rights abuses and support for terrorism’, 16 February 2012. 317 US Treasury Department, ‘Treasury designates Syrian entity, others involved in arms and communications procurement networks and identifies blocked Iranian aircraft’, 19 September 2012. 318 See for example, C. J. Chivers, ‘Life with Syria’s rebels in a cold and cunning war’, The New York Times, 20 August 2012. See also: ‘Syria conflict: UK to give extra £5m to opposition groups’, BBC, 10 August 2012. 319 See, for example, this video. For more on the use of tear gas in Syria, see for example: ‘Syria CS gas may have been made in the UK’, Corporate Watch, 6 April 2011. 320 Louis Charbonneau, ‘Exclusive: Iran steps up weapons lifeline to Assad’, Reuters, 14 March 2013. 321 Louis Charbonneau, ‘Exclusive: Western report – Iran ships arms, personnel to Syria via Iraq’, Reuters, 19 September 2012. 322 US Treasury Department, ‘Syria Designations; Syria Identifications; Non-proliferation Designations; Non-proliferation Identifications; Burma Designation Removals; Non-proliferation Designation Removals; Anti-Terrorism Designation Update’, 19 September 2012. 323 Farnaz Fassihi, ‘Iran Said to Send Troops to Bolster Syria’, The Wall Street Journal, 27 August 2012. 324 Jonathan Saul and Parisa Hafezi, ‘Iran boosts military support in Syria to bolster Assad’, Reuters, 21 February 2014. 325 US Treasury Department, ‘Treasury targets Iranian arms shipments’, idem. 326 See, for example: ‘Iraq inspects second Syrian-bound Iran flight, finds no illegal items’, Press TV, 28 October 2012. 327 Michel Abu Najm, ‘Iraqi Foreign Minister on the Syrian Crisis’, Asharq al-Awsat, 16 Jul, 2013. 328 Michael R. Gordon, Eric Schmitt and Tim Arango, ‘Flow of arms to Syria through Iraq persists, to U.S. dismay’, The New York Times, 1 December 2012. 330 Saud Al-Sarhan, ‘From Qusair to Yabrud: Shiite foreign fighters in Syria’, Al-Monitor, 6 March 2014. See also: Moshreq Abbas, ‘Flow of Iranian weapons to Syria undermines Iraqi sovereignty’, Al-Monitor, 28 September 2012. 331 See, for example: ‘Syrian fighting vehicles’, Oryx Blog, 25 February 2013. 332 These include: Brown Moses; Rogue Adventurer; Spioenkop. 333 Brown Moses, ‘Evidence of Iranian arms provided to Syria in the past 18 months’, 20 May 2013. 335 Brown Moses, ‘More evidence of sanction busting Iranian munitions deliveries to Syria’, 26 May 2013. 337 Brown Moses, ‘Anti-materiel rifles in Syria’, 18 April 2013. 338 ‘Syria and her HS.50s’, Oryx Blog, 27 April 2013. 339 Ibid. 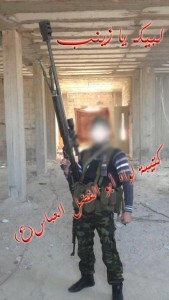 The blog provides many pictures of militiamen seen holding the rifle or using it in Syria. See also: Phillip Smyth, ‘Khamenei’s Cannon: .50 caliber anti-material rifles and Shia fighters in Syria’, Jihadology, 24 December 2013. 340 For more details, see: ‘Mercedes-Benz and Syria, a deadly combination’, Oryx Blog, 2 September 2013. 341 Jonathan Saul and Parisa Hafezi, ‘Iran boosts military support in Syria to bolster Assad’, idem. 342 See, for example, this video and this one. 343 Available on YouTube. For more on Iranian missiles used in Syria, see: ‘Mercedes-Benz and Syria, a deadly combination’, idem. 344 ‘Syria welcomes 13 Sepah missile commanders + photos’ (in Persian), Mashregh News, 12 August 2012. 345 See this video and this one. 346 ‘Iran deploying her newest drones to Syria: The Shahed 129’, Oryx Blog, 10 April 2014. 347 ‘Iran deploying her newest drones to Syria: The Yasir UAV’, Oryx Blog, 10 November 2013. 348 Mark Hosenball, ‘Iran helping Assad to put down protests: officials’, Reuters, 23 March 2012. 349 For more details, see for example: Human Rights Watch, ‘Syria: Barrage of Barrel Bombs’, 30 July 2014. 350 ‘Secrets and details of the largest arms factory in Syria’ (in Arabic), All4Syria, 17 July 2014. 351 See, for example: ‘Aleppo Missile Factory’, NTI, 1 August 2010. See also: ‘Iran aids Syria’s CW programme’, Janes Defense Weekly, 21 October 2005; ‘Syria blast ‘linked to chemical weapons’: report’, AFP, 19 September 2007; ‘Syria has expanded chemical weapons supply with Iran’s help, documents show’, The Washington Post, 27 July 2012. 352 For more details on this, see: ‘Reports confirm use of toxic gases by Syrian regime, again – Chlorine barrel bombs produce highly toxic dioxin’, Naame Shaam, 19 April 2014. 353 Con Coughlin, ‘All the evidence points to Iran supplying Syria with chlorine bombs’, The Telegraph, 6 May 2014. 354 There have been a number of investigations and in-depth reports about the Ghouta chemical attack. For example: the UN report; Human Rights Watch’s reports, this one and this one; the Violations Documentation Center’s report; and the US government’s assessment. 355 The most famous example of this was Seymour Hersh’s articles in the London Review of Books in December 2013 and April 2014, which argued that the attack may have been committed by Jabhat al-Nusra with the help of the Turkish government. For more details on the whole affair, see this commentary by Naame Shaam. There have been numerous articles and commentaries debunking Hersh’s misguided allegations: 1 | 2 | 3 | 4 | 5. The other famous propaganda piece was a Mint Press ‘investigation’ in August 2013 claiming the attack was carried out by the rebels themselves with the help of Saudi Arabia. For a detailed debunking of the story, see this article by Nafeez Mosaddeq Ahmed. 356 About previous and subsequent chemical attacks, see these reports: 1 | 2 | 3 | 4. 357 ‘Evidence suggests Sepah Pasdaran may have played role in 2013 Ghouta chemical attack in Syria’, Naame Shaam, 19 August 2014. 358 For references to all these reports, see ibid. See also: Jacob Campbell, ‘Iran’s Hand in Chemical Attacks by Assad’s Syrian Regime’, The Clarion Project, 12 May 2014. 359 C. J. Chivers, ‘New study refines view of sarin attack in Syria’, The New York Times, 28 December 2013. 360 N.R. Jenzen-Jones, ‘Alleged CW munitions in Syria fired from Iranian Falaq-2 type launcher’, The Rogue Adventurer, 29 August 2013. For a collection of articles and blogs analysing munitions linked alleged chemical attacks in Syria, see this post by Brown Moses.